My UBER app pulsed on my Phone screen. "Brian will be picking you up in 2 mins," it said as I waited for the Greyhound bus station in San Antonio. We had just gotten off an easy 1 hr bus ride from Austin. After throwing my bags in the trunk of Brian's Toyota, we sparked a conversation, "So Brian," I said, "tell me about San Antonio. It's my first time here?" Brian replied, "Here for business or pleasure?” A little bit of both (that reply never gets old). “Well over here is a Blimpie, oh and to your left is a Rainforest Cafe!, and there is my favorite Chili’s!” Uh oh…where did I just arrive. Luckily for us, Brian was only giving the rundown he was accustomed to giving tourists that are visiting in search of margaritas and selfies at the Alamo. If you peel back the Top Things To Do guidebook recommendations, you will see that San Antonio is experiencing an exciting and very real resurgence of culture, food and excellent drinking. For some context, the service sector makes up the fastest growing part of the economy here - largely due to the increased demand for healthcare. Medical and biomedical industries now account for approximately $11.9 billion of the city’s economy. As a state, Texas, is known for its large medical systems and San Antonio is no different. Their highly regarded medical industry employs approximately 25,000 people. So here we are again, for some reason or another business has brought you to San Antonio. When you arrive you most likely are in need of caffeine and a place to dock up. Luckily, San Antonio has a buzzing scene primarily spurred by the folks at ‘Local’. They have six locations around the city. 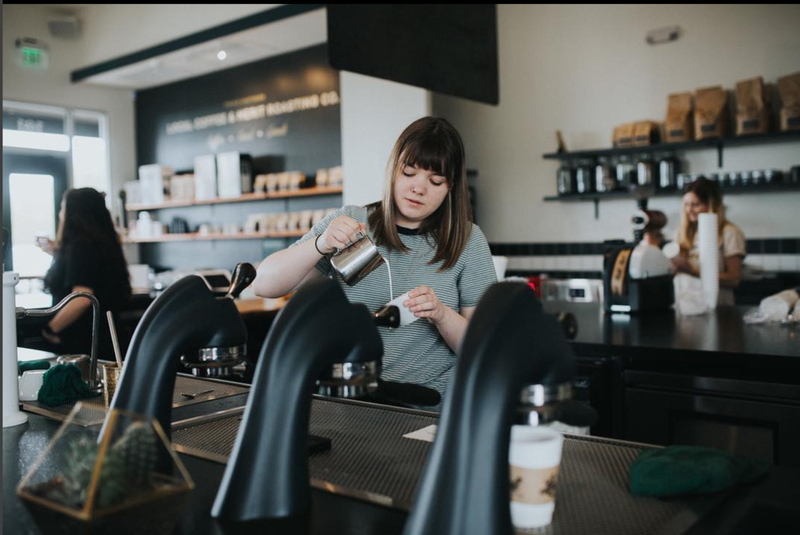 We caffeinated ourselves at their Pearl District spot. They serve beans by a local roaster, Merit Coffee Roasters. See our Shortlist other great cafes in San Antonio. As you wrap up your meetings and emails, stroll over to Supper, located in the Hotel Emma, and order a martini at the elegant wood-paneled bistro styled bar. Supper is Chef John Brand’s ode to farm-to-table cuisine. The ingredients are astonishingly fresh. Supper specializes in expertly cooked seasonal vegetables that can honestly serve as a main entree or complement your choice of meat. We started with the ‘Salt Cod and Potato Croquettes with Pickled Green Tomato Tartar Sauce and Salt and Vinegar Brussels Sprouts’. For the main dish, I had the ‘Pan Seared Bronzini with Beurre Rouge, Melted Leek, and Crispy Potato Salad’. The meal will leave you extremely pleased but not stuffed. It is an ideal choice to take a client to, as it leaves room for the all important after-dinner cocktail. If you are itching for something more after, check out Cured, to fill up on meats. They have an extensive list of cured meats and, in particular, the duck smoked pate was out of control. Grab the check and make your way to Juniper Tar. Depending on time hail a 10 minute Uber or, you can walk off the martini buzz, by strolling down the River Walk. Make a pit stop at the luxury rooftop bar Paramour. It's a lively scene and the decor is reminiscent of a Kubrick hang out in "A Clockwork Orange". The bar has stunning views of downtown San Antonio and they make a surprisingly good old fashioned. One way or another get yourself to Juniper Tar. Matty Gee of Milk and Honey in NYC has transplanted his mixologist talents to SA in this saloon style cocktail bar. The cocktails are inventive takes-ons on the classics with a commonality of fresh fruits to accent each drink. You will not be let down by this venue, oh and go check out the bathrooms. When looking to book your hotel, there are two very good options, The Hotel Havana or The Hotel Emma. However, one of them is in a league of its own not only in San Antonio but in the world. 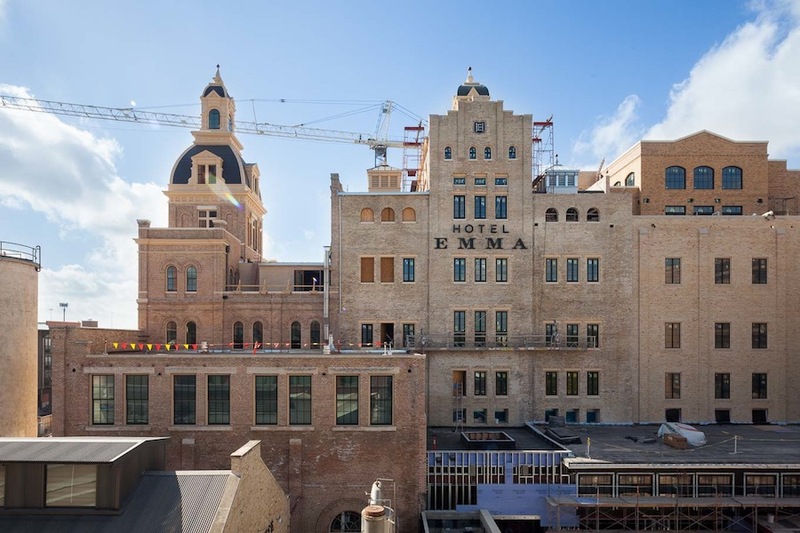 Hotel Emma, the anchor of the newly established Pearl District is a work of art. The hotel building was originally Pearl’s Brewhouse, built in 1894. The New York-based interior designers Roman and Williams restored the historic building balancing its history with modern luxuries. The lobby is the first jaw-dropper of many. The attention to detail to the steam punk styling can be noticed in the chandeliers to the exit signs. For guests, there is a secluded library reading room with a 2,700 book collection acquired from San Antonio writer and historian Sherry Kafka Wagner. They serve margaritas (hey, look we had some!) on welcome and Merit coffee in the morning. Another highlight is Sternewirth, the Hotel’s clubroom. The space has 25-foot ceilings, where you can sip cocktails inside repurposed brew tanks blocks. We were fortunate to catch up with impressive and very busy Beth Ticku Smith, Director of Marketing & Public Relations for the hotel. Her passion for the property and hospitality is immediately noticeable. Beth recognizes the uniqueness of Hotel Emma and is launching new initiatives to further weave this property into the community, with events from the nearby Culinary Institute of America (CIA) and local music/art pop up shows. Starting rates at Hotel Emma are $350 a night. Elysia Treviño Gonzales is the Chief Operating Officer of Twang Partners Ltd.a manufacturer of premium Flavored salts, sugars, and seasonings headquartered in San Antonio, Texas. The organization Prior to working at Twang, Elysia studied at University of Texas, San Antonio and earned a degree in interdisciplinary studies. She intended to become a teacher for grades K4, but after working at Twang.Part time to support herself through college, Elysia decided to stay in San Antonio at the family owned company.She cites customers’ enthusiasm for Twang products as well as her experience working alongside passionate individuals with talent, intelligence and work ethic as the reason for her remaining with the company since 1999. Before taking on the role of Gonzales worked in several aspects of the business, with a focus primarily on sales and marketing. She finds inspiration in consumers’ positive experiences with Twang and is humbled to be a part of the company, which brings happiness to millions of beverages and snacks across the country every year. In the years since Elysia took a leadership role in the company, Twang has experienced remarkable growth. They now produce several different product lines available across the country and have enjoyed double digit growth each year over the last decade. The company has over 50 team members, over half of whom have been with Twang for five years or more. Elysia currently lives in San Antonio, Texas, and enjoys spending time with her three daughters and playing sports. Q. What moments in life help get you to where you are today? My parents started Twang over 30 years ago. Growing up in the business and watching my parents intense work ethic and just the fact they were willing to do anything it took to get us going and growing.This really allowed me to just understand what hard work and some humility can do. I stepped back and had a moment of realizing how much hard work and effort had gone into what we have today, this realization inspired me to keep pushing to the next level. Second to that was understanding how to get small successes, selling our product on a store by store base to nation wide agreements I learned to under promise and over deliver, I hate to commit to something I can't deliver on. Q. When did you guys experience your first product market fit ? It was probably in the late 90s. We had small success with our condiments, Twangerz, where it was a packet that you could add to anything to give it a little more flavor but then we had the chance to work with Anheuser Busch on a tie in on a beer they were launching and we heard people were using our salt on their beers...that's when it clicked. Beer Salt..why don't we position it as Beer Salt and really give it a home and channel it to the market as that. We came up with a little beer bottle design and the product exploded. It became our leading product sold by FAR. For the first time retailers were calling us instead of the other way around! It was a surreal feeling. Since then we have come up with additional product range..and a lot of times with our products - whether it is a line extension or coming up with a completely new brand - we really start with the marketplace. And try to identify the market gap...who is NOT doing something here and how can our product or industry knowledge fill the void. Q. You had the option to pursue other career paths, what made you want to stay at the family business? I got my degree in education. I was a teacher at an elementary school for a little while and even though I love being around kids I really did not enjoy the politics of the education system. I had always been working at Twang filling in wherever help was needed. I began to do events in the field and I got to see first hand how consumers were enjoying the product and saw firsthand the happiness it brought them. I noticed our customers were super loyal ( we call them the ‘Twang Tribe’) and realized that I can have a positive impact here, that is what drew me back into the organization. Sales and marketing is important to understand or have visibility into, anything that allows you to understand your customer. Often it is easy to lose sight of your customer and focus on other parties, in our case the distributor, but let’s face it, we can get it into the store but if people are not buying it off the shelf we are doomed.